It's been rough for the last couple of weeks, but today was a good day. First, it was a good day because Eli 10.5 made it through half a day at school in "observer" mode. That's something that's becoming more common for children recovering from concussions when they can't handle doing schoolwork yet. They go to school, listen and participate in all the classes, but do no work that requires reading, writing, math, etc. In theory, this is supposed to keep kids more connected to their school while they're recovering, and it also helps them get back into the rhythm of school. In practice, it did both for Eli today. I picked him up at noon, and he was so excited that he made it through the morning. "I feel great!" he said when I saw him. "No headaches!" "Did you do any work?" I asked. "Not a bit!" he said, laughing. He was so relieved that he could be in school and not get a headache. So was I.
I've mentioned several times that I love (not too strong a word, either) to mix Dublin Dr. Pepper with Diet Coke, resulting in the perfect drink. I spend hours each week at P. Terry's burger stand (by Eli's school) because their soda fountain is the best, most consistently mixed soda fountain I've ever tasted, and they have Dublin Dr. Pepper. Dublin Dr. Pepper is still made with real cane sugar, in Dublin, Texas, and it's been made with the same formula for 120 years. Last week, the complete assholes at the Dr. Pepper/Snapple finally won a lawsuit against the people who made Dublin Dr. Pepper. There's a long history in this matter, but basically the bottlers of the Dublin version had the right to continue selling it in six designated counties (even though it wasn't an official Dr Pepper product), but not outside that area. Dublin Dr. Pepper was always available outside the designated area (in Texas), it wasn't considered a problem, since the drink constituted a tiny fraction of Dr. Pepper's sales. 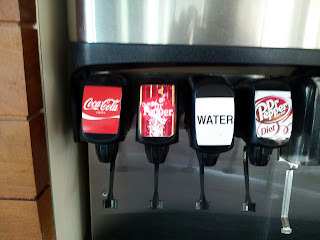 Recently, though, Dr. Pepper started marketing its own cane sugar version, and decided to muscle Dublin Dr. Pepper out of the market via lawsuit. It was settled last Friday by Dr. Pepper buying the Dublin plant and shutting down the Dr. Pepper portion of the operation. You'd think that Dr. Pepper would have bought and promoted the Dublin version, since it is so beloved, but that's not going to happen. Instead, they destroyed it. 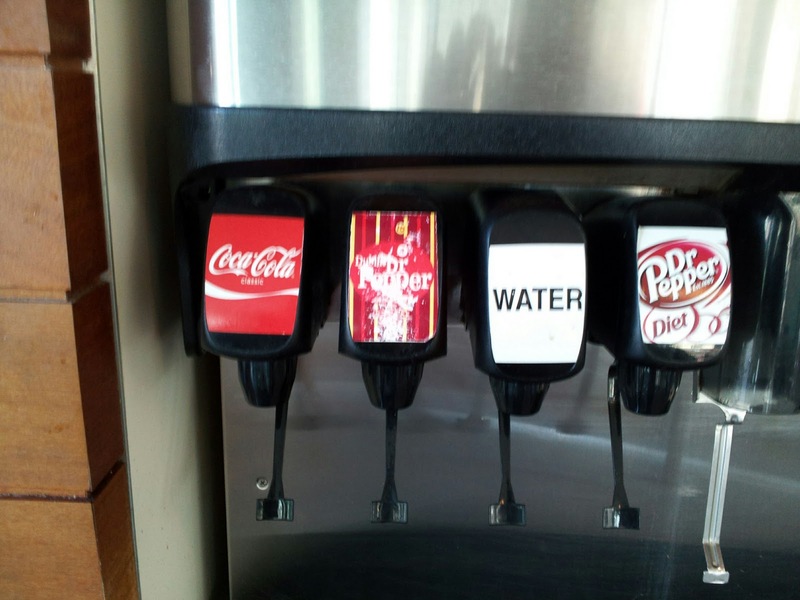 They say that they'll still be making cane sugar Dr. Pepper in other plants, and they will, but it won't taste the same. I hadn't been to P. Terry's in weeks because of holiday break and Eli's concussion, and the last time I'd gone, I'd been in a hurry and not tasted my drink until I drove off, and it was all carbonated water. I didn't have time to go back, not knowing that it would be my last chance ever. So I went to P. Terry's today about 10:30 so that I'd be only blocks from school if Eli had to bail early, and--oh, who am I kidding. I just love hanging out there. I asked them what they were going to do about the loss of Dublin Dr. Pepper, and the cashier said, "We haven't decided yet." I told her my story of not having been around the last few weeks, and that I was sorry I missed my last chance to taste it, and she said, "Oh, we're not out yet." Clouds parted. Sunlight shone through. As it turns out, they still have a few more days of supply, and I swear I drank half a gallon before I left-- my stomach should have exploded from the carbonation. And it tasted perfect, like it always does, and even though this sounds silly, it made me very happy to get to drink it again before it vanished. A little thing, but a good thing. Third, I found--well, let me tell you about the third reason tomorrow.